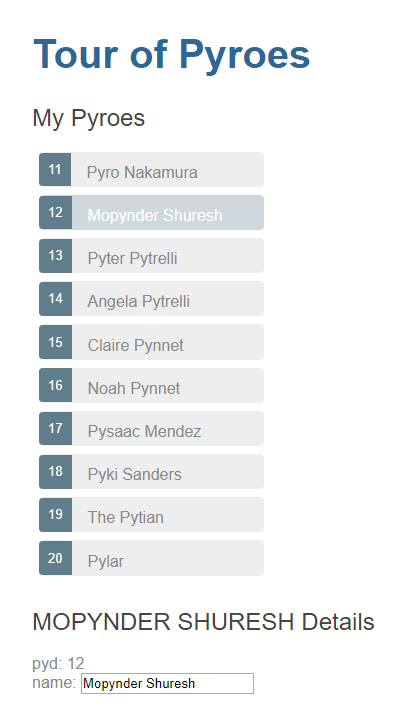 Editing the name of a Pyro and having it automatically (or is it auto-magically?) in other elements is already a great thing. But a single Pyro would probably neither save the plane nor him/herself. 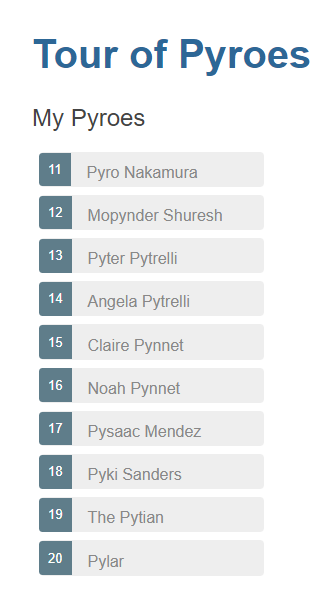 That’s why the other Pyroes come to the rescue and we need to be able to display a list with all the names to be able to choose which one will be edited. 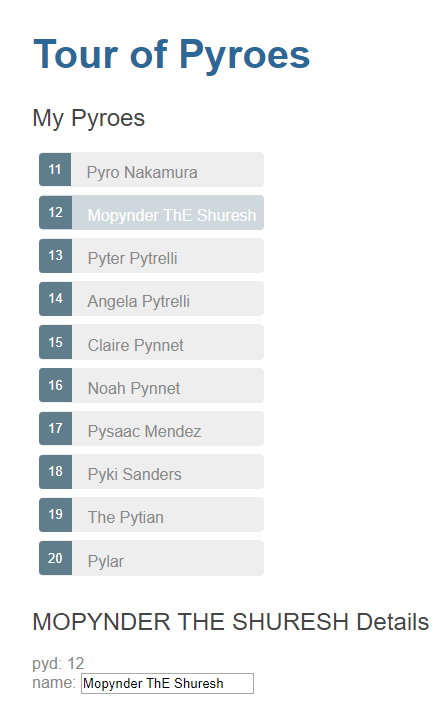 To simplify our approach, we start by adding a mock_pyroes.html file to our project layout, where we will be holding our list, which will be acting as a database. The file structure and the new database-like Python code look like this. The <ul> (unordered list) from the html content will serve as the container for the list. Create an observable that will observe pyd inside selected even if the value referenced by selected changes. And that’s what we want, because the value referenced by selected will change when clicking on it. If we had written it as self.selected.pyd_, we would then have an observable to the current value of pyd in selected. It wouldn’t track the changes to selected, but to the current underlying pyd. _bindx is specifically not named _bind to indicate that NO event is going to be delivered to the callback. Even if not obvious from the example this has an advantage when using the Obervsable attribute in lambda expresisons. The 2nd part of the html content manages the editor with no need for Python code in the component. The observable self.selected_.pyd_ is being used as a boolean. If the underlying pyd is 0 the editor will not be displayed. Anything else will evaluate to True and the internals of _display will make the d element visible.